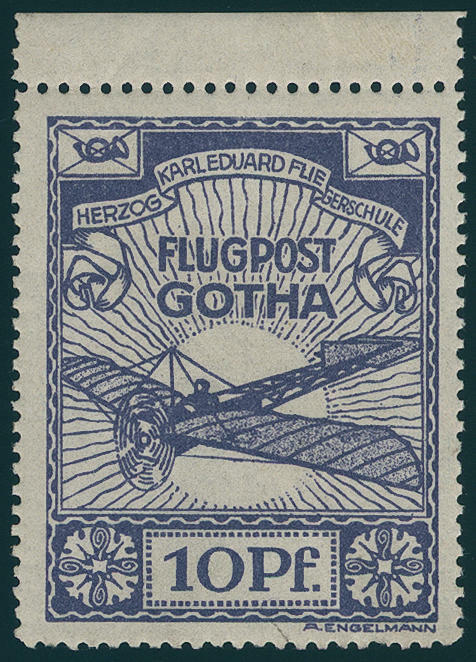 5005 5 Airmail Gotha 1912, fresh colors and very well perforated, from upper margin, in perfect condition mint never hinged small edition and in this quality hardly ever offered! 5006 FDC 6 10 Pfg. Regensburg Aviation Days 1912, fresh colors and in perfect condition on very nice First day card with violet two ring cancel \"REGENSBURG 1. Airmail 11.-13. Oct\", as well Bavaria 5 Pfg. 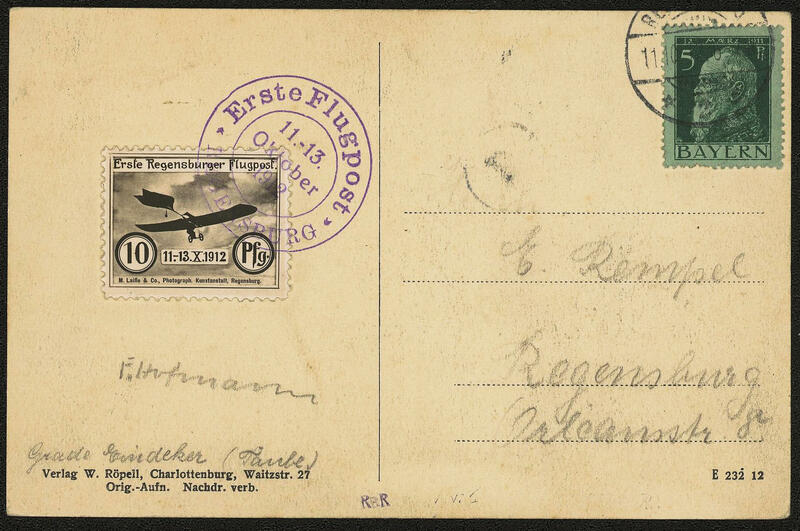 With postmark \"REGENSBURG 11.10.12. \" with on the back illustration of the pilots \"HANNS GEORGI\". A very attractive and rare card the Pioneer airmail from first day! Photo expertize Brettl. 5007 ✉ 7 10 Pfg. Regensburg Aviation Days 1912 on thick glossy paper, fresh colors and very well perforated with additional franking Bavaria 5 Pfg. With violet three circle cancel \"first REGENSBURGER flight days 11.-18. 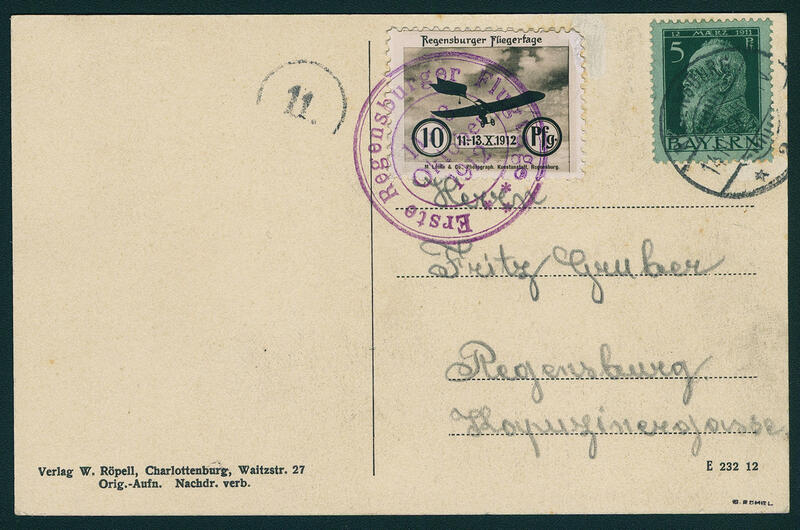 Oct 1912\" and the Bavaria franking with two ring cancel \"REGENSBURG 14.10.12. \". 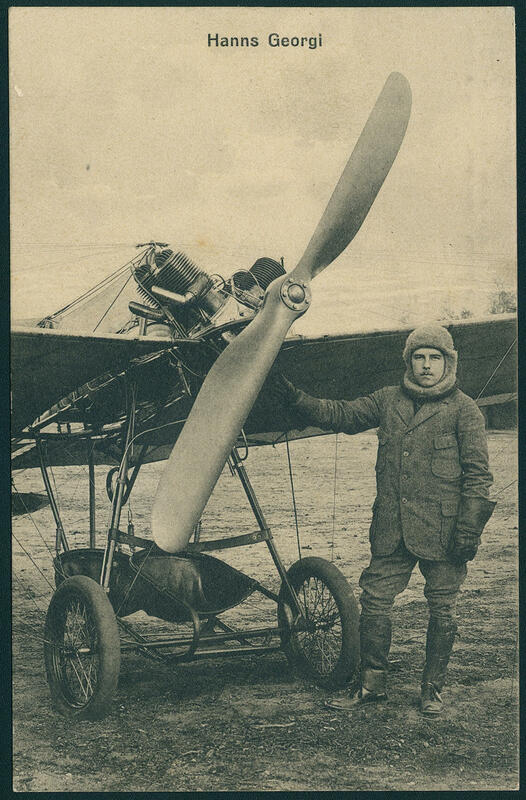 The card with illustration of the aviation pioneer \"HANNS GEORGI\". A very nice and scarce pioneer flight card! Photo expertize Sieger BPP. 4539 2a 1 / 3 Gr. Green, small breast shield, fresh colors in yellowish-greener shade, in the best way embossed and perfect perforated, in perfect condition unused with original gumming. Outstanding quality! Photo expertize \"excellent condition\" Sommer BPP. 4541 ✉ 2a 1 / 3 Gr. Small breast shield light green, having bright colors outstanding quality on gorgeous violet representative card the Music instruments Factory Friedrich Meinel sons with still used Saxony two ring cancel \"KLINGENTHAL\" to Sonneberg with arrival postmark. One of the most beautiful representatives cards of the first breast shield issue. 4542 3 1 / 2 Gr. Brick red, small breast shield, wonderful fresh colors, well perforated and excellent embossed with full original gum and tiny trace of a hinge, without any signature. An outstanding quality of this rare issue! Photo expertize \"perfect quality\" Krug BPP. 4544 ∆ 3 1 / 2 Gr. 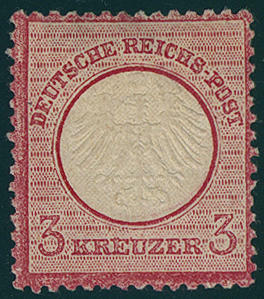 Brick red, small breast shield, horizontal strip of four wonderful fresh colors and well perforated on beautiful letter piece with still used Schleswig-Holstein two ring cancel \"CAPPELN 21.1.72\", very attractive unit from the first issue month! Michel 900,- €. 4545 ✉ 5 2 Gr. Dark gray blue, small breast shield, vertical pair, fresh colors and good embossed, upper value crease, as correctly franked multiple franking on complete package card with clear rectangle cancel \"PR. OLDENDORF 27.12. (1873). \". 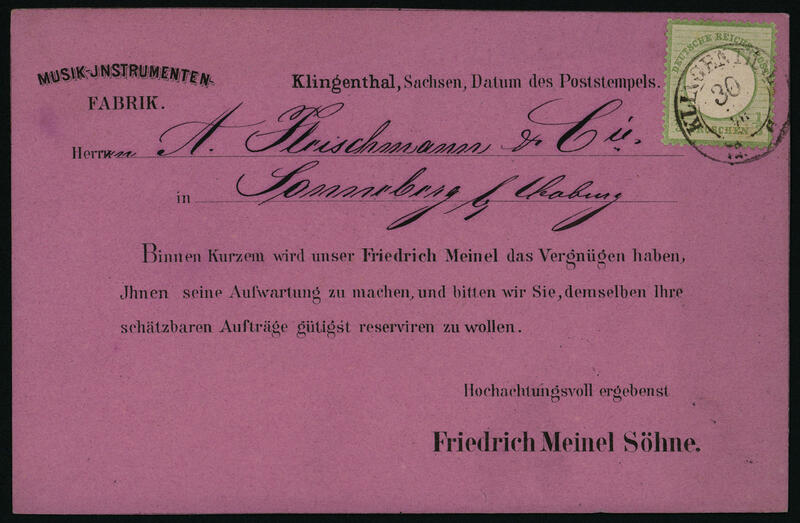 This is a very scarce early use one package address before the officially introduction date at the 1.1.1874. A breast shields rarity! Photo expertize Brugger BPP. 4546 ✉ 5,19 2 Gr. Gray ultramarine, small breast shield in mixed franking with 1 Gr. Carmine, large shield, on decorative small-format cover, a little patina, small objection, from \"STRASSBURG in the Alsace 6.11.72. 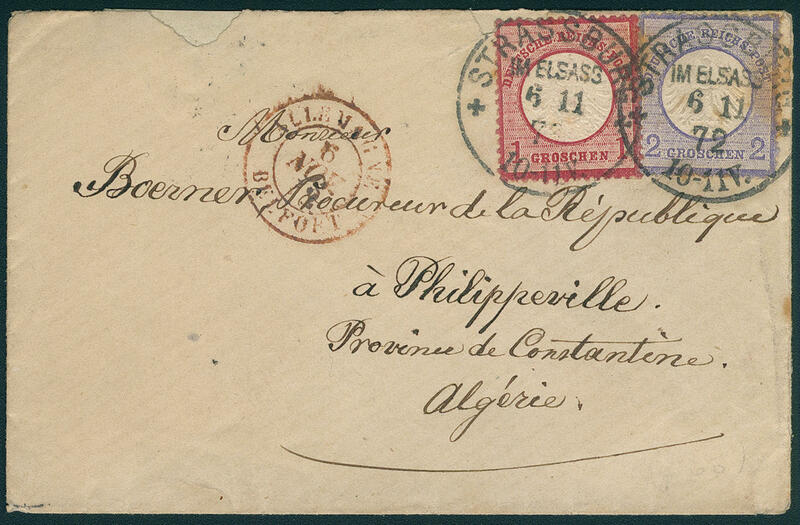 \" to Philippeville / Algeria with transit and arrival postmarks. Breast shield letter to Africa are general very rare, as mixed franking the both breast shield issues a rarity of this area! 4547 ✉ 5,19 2 Gr. Ultramarine, small breast shield, in mixed franking with 1 Gr. 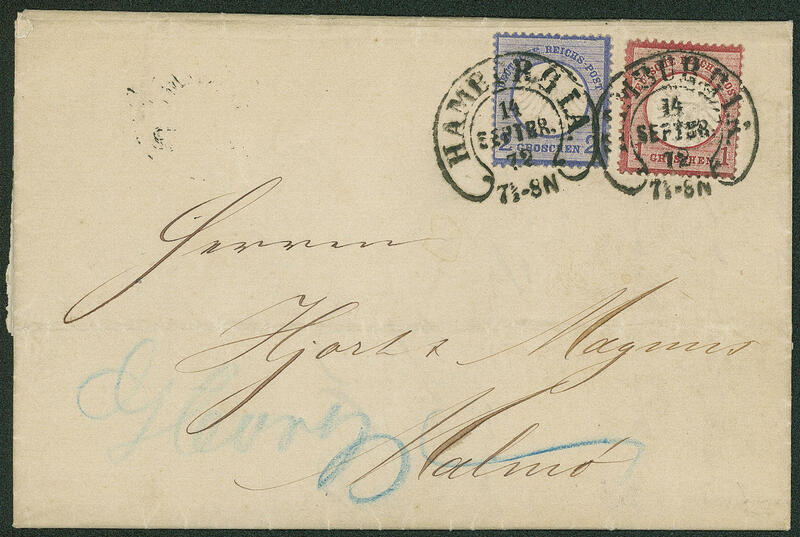 Carmine, large shield, as decorative international franking with two clearly horseshoe cancel \"Hamburg I. A. 14. SEPTBR. 72. \" to Malmo / Sweden with arrival postmark. An extraordinary franking small and large shield on an especially beautiful cover! 4548 ∆ 6 5 Gr. Small breast shield, horizontal pair fresh colors and in perfect condition on very nice letter piece with two perfect mounted pricked clear horseshoe cancel \"LÜBECK 20.11.72. \". Outstanding quality for the highest standards! Signed Horst Krause. 4549 ∆ 7 1 Kr. 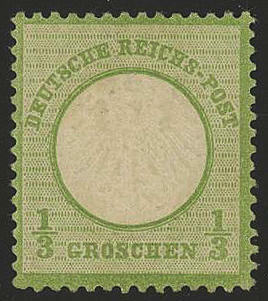 Green, small breast shield, horizontal strip of four, fresh colors, excellent embossed, very well centered and perforated on piece with clear, still used Baden two ring cancel \"WIESLOCH 2. May. \", an extraordinarily scarce and particularly beautiful unit! Photo expertize Hennies BPP. Michel 2800,- €. 4550 ✉ 7,27a 1 Kr. Yellowish green, small breast shield, as well 9 Kr. 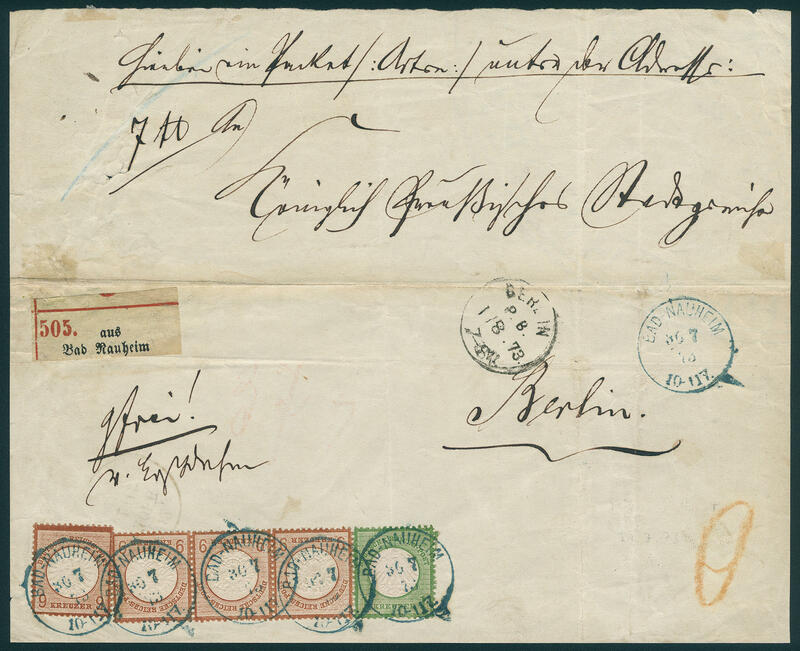 Reddish brown, large shield, in the horizontal strip of three as well as single on very decorative accompanying letter for parcels with rich in contrast scarce stamp \"BAD NAUHEIM 30.7.73. 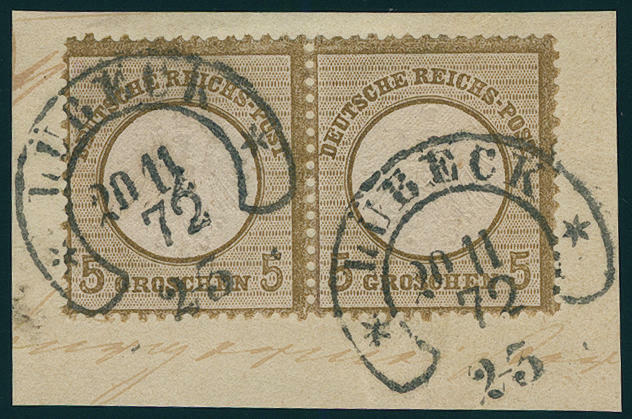 \" to Berlin with scarce arrival postmark \"BERLIN P. A. 24.31.7.73. \" (KBHW no. 496). All stamps are wonderful fresh colors and well perforated, as well excellent embossed, a slight trace of a corner crease at the single stamp to 9 Kr. Is insignificant. A fantastic cover and in several aspects extraordinarily rare. 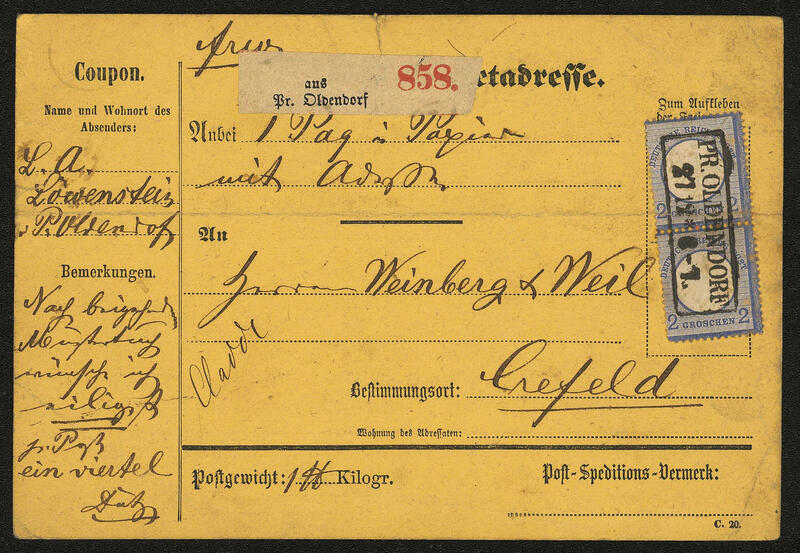 This is a scarce mixed franking small and large shield, besides about a scarce strips franking the 9 Kr. 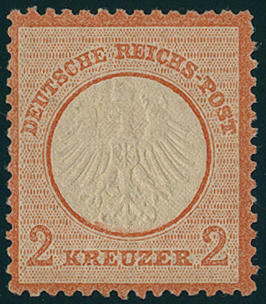 And color cancellations the breast shield issues are on such high frankings from the Kreuzer district nearly unknown. A Honor for the sophisticated special collection! Photo expertize Krug BPP. 4551 7,7IV 1 Kr. Yellowish green, small breast shield, a dreamlike nice block of four, wonderful fresh colors, good embossed and well perforated, in perfect condition unused with original gumming. 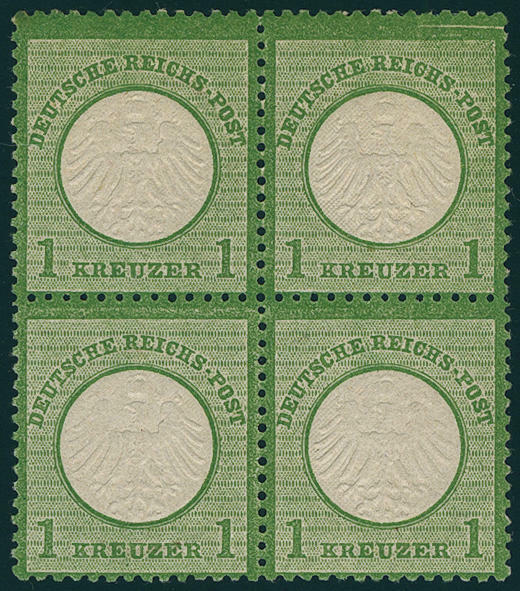 As well the right upper stamp of the blocks of four with plate flaw \"lighter line within top right\". This plate flaw becomes due to his rarity in unused condition already lots by Michel catalogue only noted without price. There are anyway only a few blocks of four in in perfect condition unused condition have been preserved. 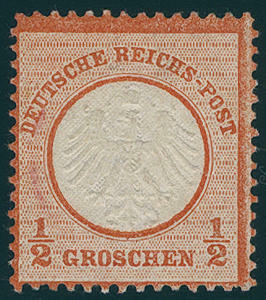 Associated with the rarely plate flaw a Top-rarity the breast shield stamps. Outstanding quality! Photo expertize \"perfect quality\" Krug BPP. 4552 ∆ 07. Aug 1 Kr. Green and 2 Kr. 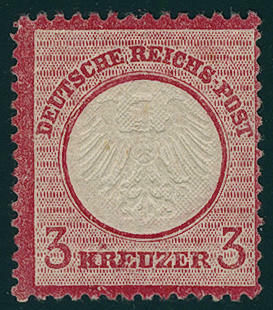 Brick red, small breast shield, both values wonderful fresh colors and excellent embossed, tiny insignificant corner tip notch at the 2 Kr., on piece with centered clear small postal agency postmark \"ST. BLASIEN small postal agency HÖCHENSCHWAND\". Unusual decorative and very rare! Photo expertize Brugger BPP. 4553 8 2 Kr. Reddish orange, small breast shield, wonderful fresh colors, excellent embossed and in perfect condition mint never hinged In this quality an extremely scarce issue, the in almost all collections is absent! 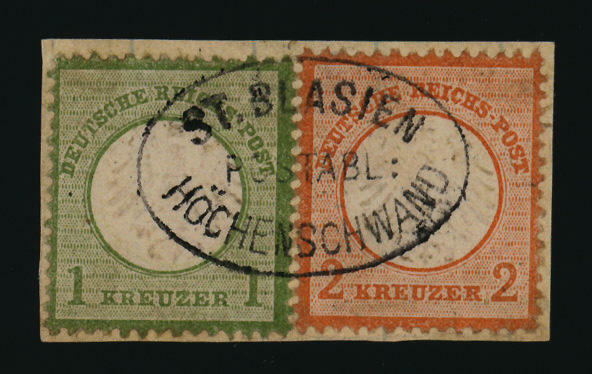 Photo expertize \"faultless mint never hinged condition\" Jäschke-Lantelme BPP. 4554 9 3 Kr. Carmine, small breast shield, fresh colors in aboriginally and fresh lighter shade, perfect centered and very well perforated, unused with original gumming. A very nice copy this breast shields rarity! Photo expertize \"excellent condition\" Sommer BPP. 4555 ∆ 9 3 Kr. Carmine, horizontal strip of four, wonderful fresh colors and well perforated on very nice letter piece with clear single circle postmark \"FRANKFURT A. M. 5.2.72. \", superb in every respect (choice copy), very decorative and scarce unit! Michel 1500,- €. 4556 9XL 3 Kr. Carmine, small breast shield, wonderful fresh colors and excellent embossed with scarce plate flaw \"oval colour spot left over first R IN Kreuzer\", unused with original gumming. There are very few unused examples with this plate flaw have become known. Photo expertize \"perfect quality\" Krug BPP. 4557 ∆ 10 7 Kr. 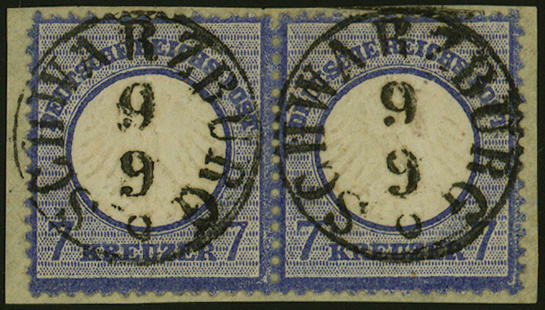 Ultramarine, small breast shield, horizontal pair, wonderful fresh colors and well perforated on magnificent letter piece with two crystal clear still used Taxis single circle postmark \"SCHWARZBURG 9.9. \", an outstanding quality for the highest standards!